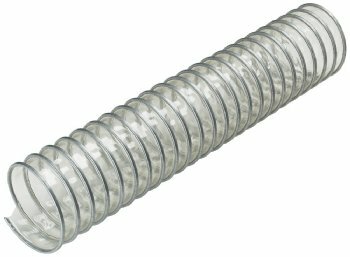 A clear hose designed to handle rugged installation. Designed for flexibility with excellent abrasion resistance. Clear wall for flow monitoring. External metal helix for scuff resistance. Material: Urethane, 20 mil, clear. Weight: 6” I.D. =1.25 lbs/ft.